15, rue Lucien Sampaix. 09 50 06 36 18. Apparently even hipsters and bobos need their vitamins, because this funky organic juice bar (there are snacks, too) is always crowded. Good and good for you. 7, cour des Petites Ecuries (enter at 63, rue du Faubourg St.-Denis). 01 47 70 13 59. Classic, affordable brasserie in the Flo chain (the one the started it all), open daily until 1:30 a.m. We really like this one. 3, rue Eugène Varlin. 01 42 05 22 51. This playfully decorated canteen serves updated Basque dishes, lightened for the lunch crowd and served with tough love by the woman who owns the place. The 12 euro lunch is a great deal. 10, ave Richerand. 01 44 84 37 70. Mon–Sat, noon–2:30 p.m. and 8 p.m.–11:30 p.m.
Go early or be prepared to queue at this Canal St.-Martin favorite, serving Thai food that is definitely a cut above Paris standards. 52, rue Bichat. 01 42 02 40 32. This charming canal-side épicerie and wineshop also serves lunch, featuring a small menu of seasonal dishes and charcuterie. Read a full review here. 10, rue de Belzunce. 01 44 53 06 20. The 32 euro menu at Chez Michel is perfectly fine, but chef Thierry Breton’s best dishes, generous and seasonal, are found on the chalkboard and will cost a little (or a lot) more. Order the paté en croute. Read a full review here. 102, quai de Jemmapes. 01 40 40 78 78. Just like most other cafés and bistros along the Canal St.-Martin, Hôtel du Nord has a bit of a bobo atmosphere, where you’ll find just as many locals as out-of-towners. The menu is varied and aims to please the palate of everyone from the bon vivant to the pickiest of eaters. Wine flows at Hôtel du Nord, as do other cocktails and a wide range of teas. 16, rue du Faubourg St.-Denis. 01 47 70 12 06. 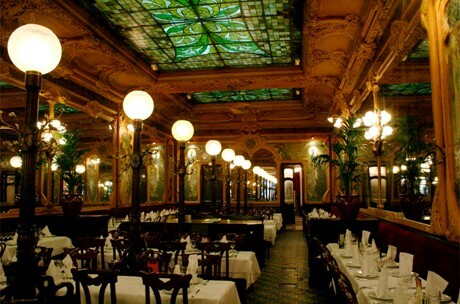 This is a bustling art nouveau bistro in an area of town you don’t frequent, but it’s near the Portes de Paris. Julien is a charming place to bring a first-time visitor, as the waiters are extremely friendly and the prices are, too. We love the warm chocolate sauce, which they pour with flourish, high above the table, onto your glace vanille (vanilla ice cream). 24, rue Cail. 01 42 05 78 43. Head to the neighborhood behind the Gare du Nord for the best Indian and Sri Lankan food in Paris. The rue Cail is a real restaurant row, and this is the place to choose. 67, rue Bichat. 01 42 02 31 70. Pizza “not like the others” is the motto at the Pink Flamingo, and it’s not kidding. The Bjork features smoked salmon; the Che, Cuban roast pork and plantains. You can eat in, take food home or have it delivered. Cédric Casanova’s Sicilian olive oils are served at some very famous restaurants (Ducasse, anyone?). But for something really special, book the single table in his tiny boutique for a lunch or dinner featuring the best of the Sicilian pantry. 67, rue de Lancry, in the 10th. 01 48 03 17 34. Reserve ahead if you want one of the few tables at this popular caviste of natural wines. Otherwise this is the place to pick up a bottle for drinking along the Canal St.-Martin. Read a full review here. 137, rue du Faubourg du Temple. 01 42 39 68 68. Zorba is busy day and night, with people chatting, smoking, drinking, reading and simply being French. This is the real Paris, with people of every background, size, shape and color.